I noticed a new comic book distribution model today in Korea: selling them in convenience stores. This is actually a very new approach that began in October of this year. 2030 Comics are aimed at the 2030 generation (people in their twenties and thirties). They feature a series of seven comic magazines. Apparently, they are selling quite well. I could only manage to find a couple first volume comics left in the magazine rack. They are being sold exclusively at GS25, a convenience store chain in Korea. See, you can spot the GS25 logo on the cover. 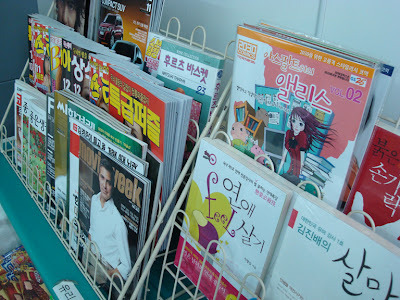 Most Korean comics come in a bounded collection of multiple stories or in graphic novel format. 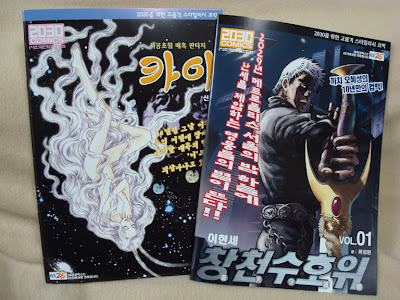 Unlike most Korean comics, they are published in a Western format. I'm quite impressed that the comics are printed in full color, contain absolutely no advertisements, and still manage to cost only KRW1,500 per copy. This doesn't seem profitable, but apparently there is governmental support in this venture. This is a unique experiment. I'm interested to see where it leads. Let's hope that the most popular stories are turned into animated projects! What do you think? My friend sent me your site, and I wanted to let you know that what your doing here is absolutely great! I'm from Toronto, Canada, but have been in Korea recently for a year and loved it there. 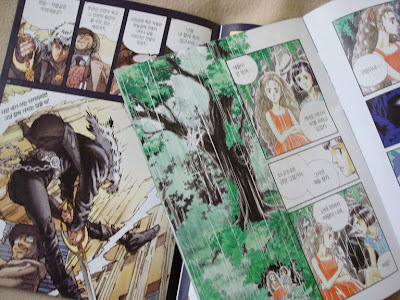 It's kinda unfortunate that there aren't a lot of korean manga/graphic novels shown in most places. But I definately enjoy the time you took to check these out and show everyone what animation in Korea is like. Korea these days is bubbling at the tipping point for some amazing works coming from many talented artists there. They do have a distinct style and should be expressed as such. Please let all those animators that I say 'hi'! and would love to visit them when I go back to Korea. For now, feel free to check out my artwork, animations and music found here! Wow, somebody actually sent you this blog? Too cool! I agree and think that there are a lot of really cool animation and animation related projects coming from here really soon. Please keep checking back as I hope to get more interesting and in-depth stuff up on this blog soon. Thanks for the encouragement! And I passed on your greetings to some animators. I read your post and yes i thinks that it will became one of the best thing of convenience store!! !